The first of the grave photos are of the Fleming graves, in particular that of Hans Fleming, his son and grandson. The plaque for Violet Muriel Bassett is on the base of the Fleming stone as she was one of Hans Beresford's daughters. The white monuments are what they looked like when viewed by my father Edward Greer Fleming in 1942. The coloured ones are how they appeared in 2010, sadly deteriorated to a point of being unreadable. 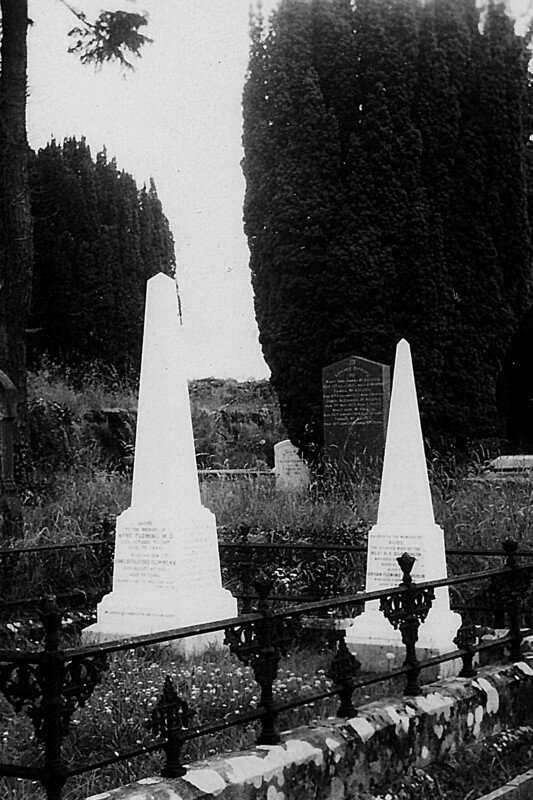 Fortunately their inscriptions were recorded by William J. McGrew of the Omagh Family History Society and published in his book "Tombstones Of The Omey" in 1998. The wording may not be exactly as it appeared on the stones but the information would be otherwise correct.